Running in Frankfurt, Germany. Best routes and places to run in Frankfurt. 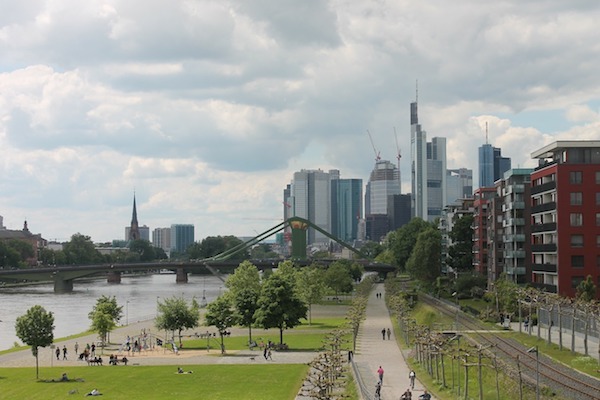 This is our running guide to Frankfurt, Germany — the fifth largest city in Germany and an important commercial and cultural center. It is the largest financial center in continental Europe, and a major transportation hub, with one of the busiest airports in the world. Much of the city was damaged during World War II, but the old town (Altstadt) has been largely rebuilt. 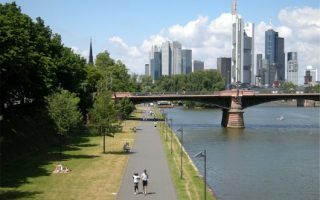 The running highlights of Frankfurt are centrally located, and include paths along the Main River, and several major parks and gardens, such as Grüneburgpark and Palmengarten. 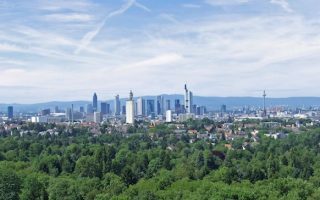 We also include a ‘runseeing’ tour of Frankfurt’s highlights, and a loop around the Wallanlagen, a 5 km green belt around the city centre following the former city walls. Further afield, the Stadtwald (City Forest) has some great running, and there are also nice paths along the Nidda, a tributary of the Main, just north of the city. As one might expect, transportation in Frankfurt is world class, with the S-Bahn, U-Bahn trains/subway, and extensive trams and buses. The airport is a 12-minute train ride from downtown. So it’s easy to work transport and bike sharing/infrastructure into your runs. A signature run in Frankfurt along the Main River. Wonderful paths with great views. South side features the green belt along the Museum Embankment, while the north side skirts the Altstadt. Numerous bridges allow for loops of varying lengths. Three neighboring green spaces in the northwest part of Frankfurt. 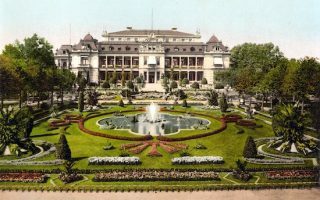 Enjoy the botanical gardens of Palmengarten, and then Grüneburgpark, whose paths are done in the English style. Also includes a quick jaunt through the campus of Goethe University. A series of park lands around the former city walls, making for a nearly 5 km green belt. 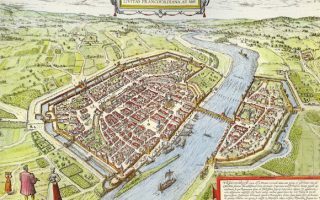 A great way to skirt the perimeter of old and new Frankfurt, through seven areas named after former city gates. Add on by running along the Main river paths. Pleasant, flat path along this tributary of the Main river. Runs 10.5 km from Höchst, north to Eschersheim. Nice views of the river, and increasingly country-like as you head north. Good public transport access at either end. Huge city park about 7 km south of the city, with 400+ km of trails for any form of activity. Lots of opportunities for running, from gentler terrain through fields, to good trail running options. Well signposted. Visitor Center has info on more detailed routes. Frankfurt has a temperate ocean climate. The city is known for a fair bit of clouds and rain, but temperatures are moderate. Summers are warm but not hot, with average highs in the high 70sF (25C). Winters feature lots of overcast, with temperatures cold but not frigid, with average January highs of 40F (4C) and lows just below freezing. There are about 22 inches of rain a year – more in summer do to thunderstorms. About 1/2 of the days see precipitation. Frankfurt is a major commercial center, so there’s a large selection of hotels. There aren’t many right in the old city (Altstadt), but there are lots of hotels in the main downtown. A good area to stay near the Main River run is just to the east of the iconic central train station (Hauptbahnhof). 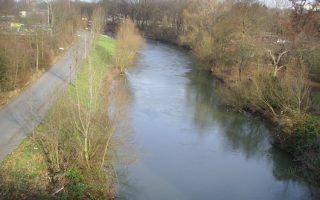 If you stay inside or near the Bleichstraße, you’ll have good access to the best runs in Frankfurt: the river, and the Wallanlagen green belt. There are plenty of running stores in Frankfurt. Runners Point. Running store chain with several outlets in Frankfurt. Laufland Rhein. Centrally located running store. Frankfurt River Runners is an English-speaking group of runners who meet several times a week for group runs. Frankfurt Run in the Dark. November. Stadtlauf Frankfurt. 5k and 10k run through the city.